There's nowhere quite like Shinjuku. And in Shinjuku there's nowhere quite like Golden-gai. Hidden in a small plot of land tucked behind the cavernous Isetan department store, behind the Shinjuku ward public office, behind the glitz of the brothels of Kabukicho, and behind the storied Hanazono shrine, Golden-gai is a tiny neighborhood within a neighborhood, a series of alleys each packed with dozens of even tinier bars. Since the early postwar era, the famous, the infamous, and the nameless have been pulling up seats at the counters in these squat wood and mortar buildings, plunging themselves into drink and conversation until the first train of the morning. Artists, writers, singers, filmmakers, transvestites, revolutionaries (yes, really; I once met a veteran of a 1950s Communist armed struggle faction), and plenty of other tipplers have been losing and finding themselves for decades amidst the flitting butterflies of the tiny neon signs, and the alleys of Golden-gai have been a main place of the production of the culture of postwar Japan. In the first years after the war, the ramshackle houses made up a redlight district, but before long most of the brothels closed and hundreds of bars opened up. As the years grew long, so did the clientele of Golden-gai, and by the 1990s, it looked as though the whole area might be bulldozed for a development project. Queuing up Fuji Keiko's classic "Shinjuku no Onna" (A Woman of Shinjuku) might provide the proper mood. But a few years ago, things started picking up again; new lease guidelines were drawn up, and a host of new bars opened their doors, some of which brought in trendy new themes and some of which positioned themselves firmly in the storied history of the district. Golden-gai today is filled with a nostalgia for the past, but also with people and places who hold onto a different understanding of the possibilities of the present and a style on the fringes of mainstream Tokyo society. And such an outlook holds as true for Golden-gai's lone ramen shop as it does for its countless watering holes. Because for all the places to drink in Golden-gai, proper food can be a bit hard to come by. 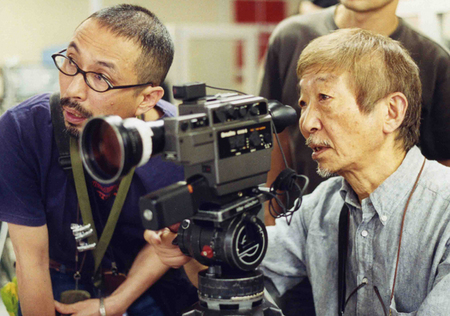 In 2004, a young man from Kyushu named Ikuda Satoshi took the first steps to change that. At the age of just 27, Ikuda, who had trained in various classic Hakata ramen shops, began the practice known as aida kari - borrowing bar space one day a week to run a guerrilla ramen shop. Ikuda pulled his indie ramen up by the bootstraps, first winning a contest for a semi-permanent spot in Tachikawa's ramen square noodle theme park, then opening a successful shop in Shibuya before triumphantly returning to open his own shop in Golden-gai in the summer of 2008. Down the second of Golden-gai's alleys, a heavy black door like many others stands closed. I grabbed the knob of the door marked with the obscure kanji for "Nagi" and hesitated for a moment - is it really a ramen shop behind these doors? I felt the momentary jump in my chest that always comes with opening the door of a new place in Golden-gai; that fleeting second on the threshold of stepping into another trip down a new rabbit hole. I would have gotten a better photo of the door, but before I could get a good one, a tall transvestite and her entourage sashayed down the alley on a photo shoot. Such is Shinjuku. I tugged the door open and climbed up the rickety stairs to the second floor, hearing the clamor of excited conversation grow louder as I reached the ticket vending machine at the top of the stairs. If it weren't for the vending machine, there's not much else to let on the Nagi is a ramen shop and not any other bar in the area -I was greeted with the sight of patrons sitting jammed in elbow to elbow perched on tiny stools in a dimly lit room, gesticulating with lit cigarettes and nodding along to the jazz on the stereo. The big tip off that Nagi is in the business of the slurpy stuff is the overpowering smell of boiling sardines. Each branch of Nagi serves a completely different style of ramen - the Shibuya shop serves up extra thick tonkotsu (pork marrow soup), the Tachikawa branch does a classic Hakata-style noodle, and the newly opened Komagome outlet dishes out an old school Tokyo shôyû (soy sauce) soup. 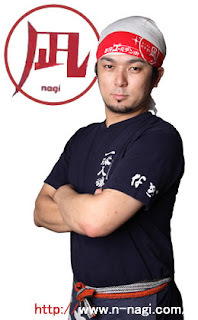 But Nagi deals in a reimagination of one of Japan's most obscure ramen styles - Tsugaru ramen. The Tsugaru region is in the western corner of Japan's deep north prefecture of Aomori, an area well known for some of the finest seafood in Japan, which finds its way into the local ramen. Traditionally, Tsugaru ramen uses only sardine (niboshi) and other dried fish for the broth, but Nagi follows in the great tradition of Aomori imports like avant-garde playwright and director Terayama Shûji, musician Mikami Kan, and cinematographer Tamura Masaki, all of whom reinveted themselves after arriving in Golden-gai. What this means at Nagi is an inventive take on the traditional Tsugaru-style bowl, adding tons of dried sardines to an already thickish shôyû broth rounded out with pork and chicken stock. Nagi purposefully leaves in the naturally bitter, vinegary taste of the fish, and what results is something entirely different from a standard "fishy" tasting bonito-stock broth. I'm no great fan of gyôkai (seafood base) ramen, but the rawness of Nagi's broth puts it in a category all it's own. Apologies for the low quality of the pics, but what can I say, some places are meant to be dimly lit, and Golden-gai is one of them. But the innovations don't stop there. Tsugaru ramen is known for super thick, super chewy noodles, almost like curlier udon. Nagi uses 45% kansui (alkaline) water, which gives the noodles an extra sproingy texture, making them some of the very best I've eaten in Tokyo. So far so good. But then there's the OTHER set of noodles in the bowl. On top of the basic noodles are several thin sheets of noodle flour several inches wide, not unlike unfurled wontons. Definitely a great way to mix up the slurp, the flat noodles go down smooth and are even available as a separate side dish of "noodle sashimi." There are also tsukemen (dipping noodles) and assorted bar snacks on offer. Then there are the toppings. Not stopping at standard thin scallion greens, Nagi serves up a bowl loaded with coarsely chopped chunks of the scallion's thick white roots. It all adds up to an extremely unconventional, very satisfying bowl of ramen. But there's one last thing - in my book what really takes Nagi to the next level, catapults it into a category of its own - the small container of pepper oil on the counter. But it's not your average râyû (chili oil). Oh no, it's something much better, a true masterstroke - a thick yellow oil squeezed from huajiao, the numbing Chinese flower peppers known as sanshô in Japanese. 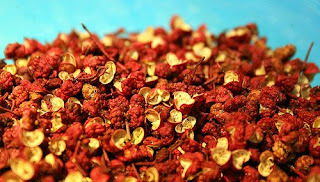 Sanshô give only a mild spicy burn, but leave the tongue and mouth tingling while imparting a deep, woodsy, metallic, peppery, almost indescribable taste. A little dollop of this stuff balances the bitter sardine broth perfectly, neutralizing the rougher elements of the fish and taking the whole thing to the next level, leaving your mouth drooling for more. I sat slurping, tapping my fingers to the free jazz, and gazing out the tiny window down onto the drunken men staggering through the rain between bars. A few minutes later, I'd clomp down the steep stairway and become one of them myself, pulled in by the flickering neon to my own favorite cubby-sized watering hole. Dude you are a master of research! I don't mind long posts when they are as educational and interesting as yours.